Thanksgiving is, of course, the beginning of the Xmas season in the United States. Everyone takes a day to spend time with loved ones and rest up a bit, giving thanks for all that is well and good in their lives. The festive among us put up Xmas trees and other holiday trimmings while the more adventurous plot how to take maximum advantage of “Black Friday” retail savings. Everything stops for a day and the world seems to change; it will be different for the next thirty days or so. In addition to changes in decor, another environmental shift signals the start of a new season: it is now acceptable to play Xmas music. Yes, an entire sub-genre of music that is forever relegated to irrelevance for all but four weeks of the year is suddenly thrust into the spotlight. In fact, numorous radio stations throughout the country devote all of Thanksgiving’s Day to nothing Xmas tunes as a way of ushering in the season, Some stations continue the practice through Christmas Day. The thing is, as nice as it is to hear the songs one hasn’t heard in a year’s time, Xmas music gets old. Fast. There’s a reason it languishes in obscurity for the majority of the year… It’s repetitive; the handful of staples that one hears ad infinitum each year quickly wear out their welcomes. 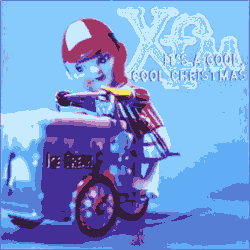 That’s why I really enjoy this album: It’s a Cool, Cool Christmas. Released in 2000, this compilation features a plethora of notable indie rock bands performing some fresh, inventive and just plain off-the-wall renditions of the classics as well as some nice original compositions, like the one below. The group is Grandaddy, the song is Alan Parsons in a Winter Wonderland. Yeah, it’s goofy, but it’s got a kind of silly charm.